Meet Dr Maria Balshaw CBE, director of Tate! Art, people, artists, ideas, money. Washing pots in an American Diner. Production line packing at Speedibake, Northampton. I am most proud of my two now adult children but their wonderfulness is entirely their own achievement, so in work terms I would say the beautiful expansion of The Whitworth by MUMA (which I hope many of you visiting Manchester for Clore Emerging Futures 2018 will go and see). That we give in to fear. Kindness, tenacity, bounce-back ability (with thanks to Keith Merrin). Seeing people in Tate’s galleries, exploring curiously. That and cake. Work isn’t always immediately or straight-forwardly fair. But if you work hard and do a good job, it will (eventually) be noticed, and rewarded. Be who you are, not who you think you need to be. 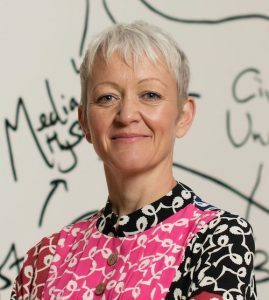 Maria Balshaw is our Big Ideas keynote speaker at Emerging Futures 2018, where she will be discussing the role leadership in cultural institutions, and how those spaces meet the needs of our ever-changing society.